Blizzard is sponsoring the Sci-Fi-London film festival and will have the StarCraft II beta available to play at the event. Sci-Fi-London is an annual film festival which has showcased premiere science fiction films since 2002. This year's event takes place from April 28th through May 3rd at the Apollo Cinema in Piccadilly Circus, London. Blizzard Entertainment has announced that the company is a sponsor of Sci-Fi-London and that there will be a chance for attendees to play the multiplayer beta of StarCraft II. As far as my sources (John Funk) can recall, this will mark the first time that Blizzard has been at a public event in the United Kingdom. Because Blizzard is a company full of sci-fi nerds and geeks just like you or I, it was an easy choice for them to pick a science fiction convention and film festival to attend. 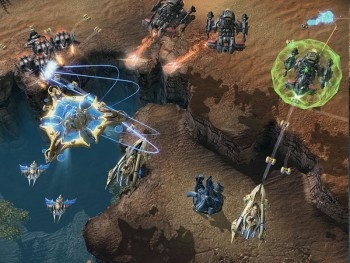 "As a company of science fiction and fantasy buffs, we're working hard to provide a compelling gameplay experience and tell an epic story with StarCraft II: Wings of Liberty," said Mike Morhaime, head of Blizzard. "SCI-FI-London is a unique opportunity for us to present StarCraft II to an audience of people who share our passion, and we're excited to be participating." U.K. SC2 fans, mark your calendars and buy your tickets for Sci-Fi-London early so that you get a chance to see some great nerd films and maybe try out your carefully devised Protoss strategy. Don't forget to construct additional pylons!